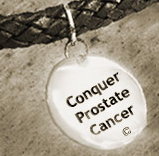 Conquer Prostate Cancer Now: Prostate Cancer Patients: Victim or Victor? Prostate Cancer Patients: Victim or Victor? Prostate cancer patients, survivors and others know that it's not always possible to engage in the power of positive thinking, especially before a critical operation or some other prostate cancer treatment. But the converse is also true: It is usually feasible to avoid a negative approach anticipating that yours will be a terrible outcome. Even those who face treatment for advanced prostate cancer should know that anticipating the worst can lead to unwanted results. In confronting prostate cancer or other forms of cancer, we need to steel ourselves against adverse, self-fulfilling prophecies that tend to work against our best interests. This is particularly true whenever we want to safeguard our health. Whatever your health status, I urge you to believe you can be victorious. It's just as easy to believe that, as to succumb to the notion that you will remain a victim of your disease.